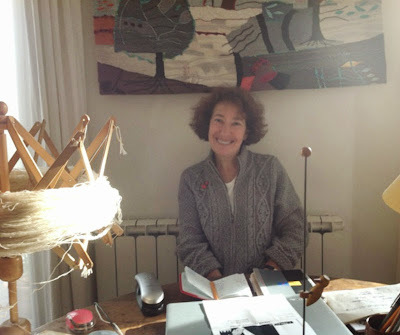 When I visited Catherine Misan at her workshop and home, I had an impression of déjà vu. I felt like if I was living a typical French movie scene. I went upstairs using a spiral staircase in a building without an elevator. When I reached up the fifth floor, there were four doors, without names or indications on them. I was lucky in my choice, I picked the first doorbell on the left and Catherine Misan opened the door. She led me through a tiny kitchenette toward a more luminous room, her workshop / bedroom! Her apartment is tiny and typically French. The quarter of her workshop / bedroom is occupied by a high-warp loom. This is a large wooden frame that allows her to capture at a glance all the surface of her piece in progress. Usually a woven tapestry is worked from the back side. But Catherine works from the front on her vertical loom, like if she was painting a picture. Also, Mrs. Misan doesn’t make a sketch of the design before beginning to weave. She creates the design in the spirit of the moment. I took my time for looking at the several photo albums, admiring all her pieces since the beginning of her career. The majority of those magnificent tapestries are wisely rolled up and put away in a wooden chest. Ingeniously, the chest is also used as a coffee table, in the living room. This way, Catherine’s tapestries are her constant companions, ready to be exhibited for an eventual career retrospective. But a career retrospective exhibition means a lot of organization, paperwork, contacts and managing. Catherine prefers to spend her time in weaving her pieces, a more satisfying occupation. Victoria Darolti has developed a special expertise to bead pieces without using any thread or glue! I was eager to discover her magical trick. As for her professional background, Mrs. Darolti was born in Romania. Her granny and her mother taught everything to her concerning embroidery. The only thing she learned in France is Tambour Work (crochet de Lunéville) that helps a lot to stitch rapidly sequins and beads. Mrs. Darolti is very busy, especially during the season of Haute Couture shows. She works with famous designers for fashion shows and she participates to exhibitions under her own signature and she gives embroidery classes. Finally we agreed for a little window of opportunity in her loaded calendar. I came to her workshop well equipped. At her request I brought a hoop, the background fabric, the beads and a piece of sheer fabric reminding the appearance of water. 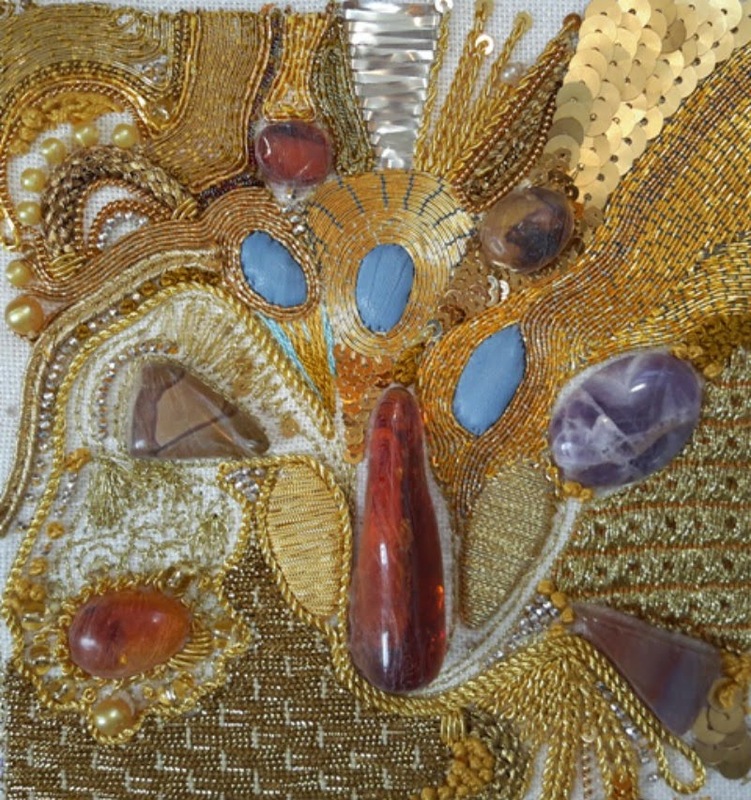 The beads were semi-precious stones from my hometown (Baie-St-Paul): agate, jasper and amber and stunning precious and semi-precious gems created by Marie-Josée T.
Mrs. Darolti's workshop is tiny and allows no more than three stitchers at a time. So, we began to work. Right away she corrected me about the method I used to straighten the fabric. Apparently, I didn’t take in account the line fabric. Strange enough, I was using a method I learned in France in two reputed schools: at Lesage’s in Paris and at les Grenadières’ in Cervières! Therefore, she undid my work and we began anew. Halleluiah! We finally began to put on the beads on the fabric, indeed without stitching or gluing them. At that moment she shared with me her professional secret. A difficult method for me, a delicate operation, I couldn’t manage the beads. They kept slipping away off the fabric. They played with my patience. I was in need of extra hands. Mrs. Darolti had to help me and I worked with four hands. You can see below the result of my apprenticeship. Sorry, this is a secret and I promised not to reveal it. The class lasted one hour, the most expensive class I ever had. It seems secrets are beyond price! 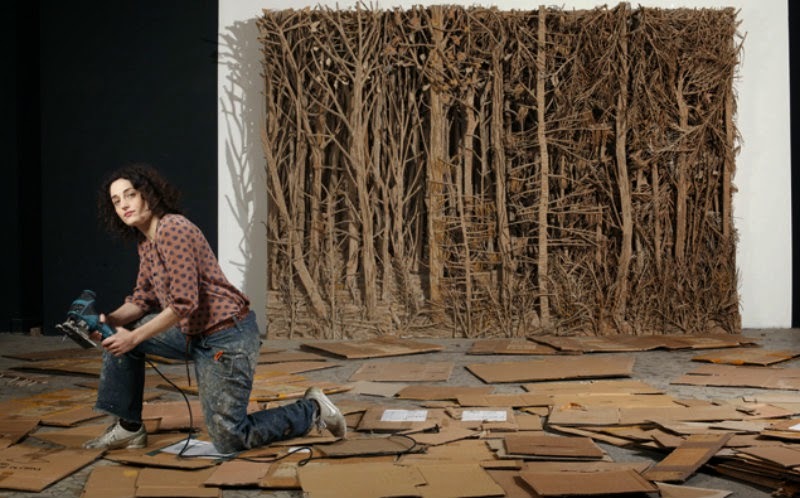 Eva Jospin’s sculpture La forêt (The Forest) is hosted in la Galerie des Gobelins. A singular thing, La forêt is entirely made of corrugated fiberboard and hosted in the famous woven tapestry workshop: L’atelier des Gobelins. Nevertheless, the surroundings serve well the purpose of La forêt. 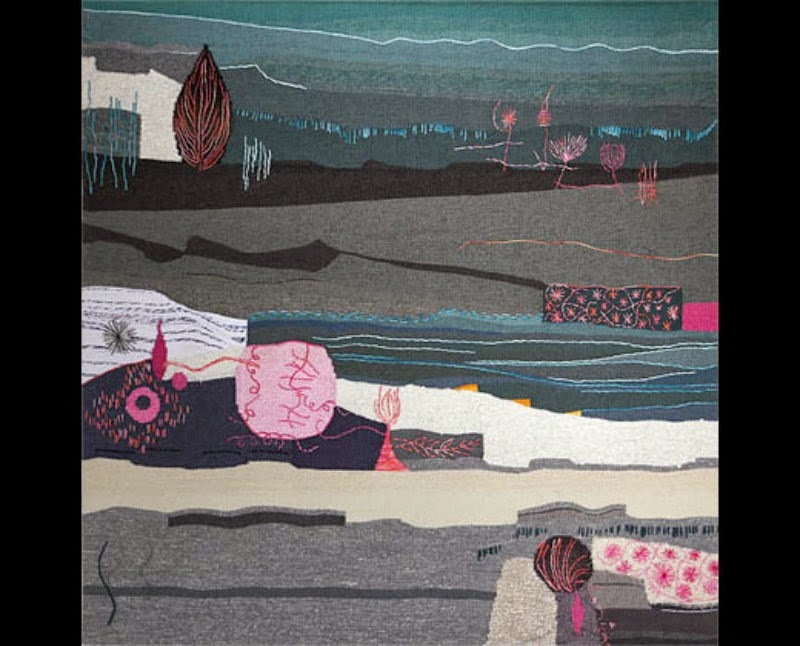 To have access to Eva Jospin’s piece of art, first we cross luminous exhibition rooms, large staircases, vast corridors where are exhibited magnificent and huge tapestries of art, woven at les Gobelins’ workshop. At the end of this labyrinth awaits us, in a dimly lit room, a large, dense, somber and threatening forest. The illusion is complete, we can’t imagine the piece to be made of simply corrugated fiberboard. This forest is so thick, no one can penetrate it. There are a multitude of trunks, branches, leaves. The ensemble suggests an old forest in great need to be cleaned and pruned. The forest is asphyxiating. It gives an impression of the doomsday. Eva Jospin achieves that effect by piling layers over layers of corrugated fiberboard that she cuts off, carves and glues. The piece of art is impressive, 7 meters length x 3 meters width. One can’t be indifferent to that work. Here I am again linked to the 17th century by learning the art of Woven Trim. 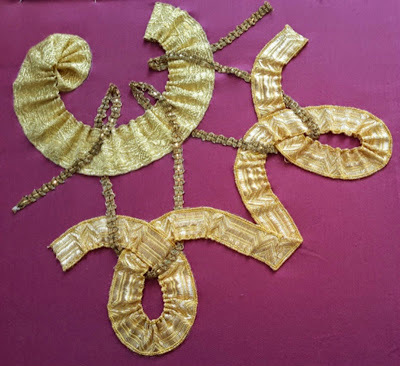 To succeed at stitching and designing with woven trims, the method is well defined. First you need to take great care to draw with precision the design on paper. For this, use a dressmaker's chalk the same width as the woven trim. Then, redraw only the outside lines of the woven trim design. Next you copy the design on the fabric. The stitching thread you will use must be thin and the exact color of the woven trim. The length of the stitches must be very tight, 3 millimeters in the curves and a little bit longer elsewhere. But, what is all that fuss over woven trims? During the Louis XIV era the art of Woven Trim was extremely popular. The code at the royal court specified that only the king had the privilege to wear woven trims of gold. Louis XIV wasn’t named the Sun King for nothing after all. The members of the royal family were allowed to wear silver woven trim garments. The nobility was allowed to wear faked gold, meaning yellow color woven trims. And the rest of the population could use linen and other fabric for braids. What is the difference between ribbons and woven trims? The ribbons are thin narrow pieces of silk fabric. And the woven trims are thicker fabric used to underline the borders of headgears and other pieces of clothing. In the 17th century the woven trim was produced in three prescribed widths: narrow, medium and wide. The use of the three different sizes of width was fortunately allowed on a same piece of clothing. The famous gardener of the Château de Versailles, André Le Nôtre, was inspired by the Art of Woven Trims when he designed the spectacular gardens.